What is the difference between heat pump air conditioning vs. other forms of air conditioning? Learning the major differences between the heat pump air conditioner and a central or split air conditioner system is vital when you are searching to buy a new home. Many homeowners, especially ones thinking about remodeling or revamping an older home with central air or air-con often wonder what would be the advantages of using a heat pump. Below are some benefits of using heat pump air conditioning in place of other types of air cooling. Standalone central air conditioning units are very common back the early 1950’s and 1960’s in many parts of the world. In fact central air or AC were a big selling point in many post World War 2 housing developments. Fossil fuel furnaces that burned natural gas, propane or oil were the standard methods of heating a modern home in the middle of the 20th century. But the rising cost of fuel along with concerns over the environment made it more difficult for most home builders to include an old fashioned dual central air and furnace system in newer homes. Starting in the late 1960’s the installation of heat pump air conditioners became more and more popular. 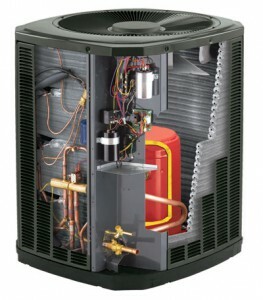 Heat pump air cooling and air conditioning have many similarities in how their systems work. Both heat pump air conditioning and ordinary air conditioners rely on the principle of heat transference. Basically they work by pulling heat from the surrounding air and then moving or transferring that heat into another location. Brand and Model: As a home buyer you really don’t have much choice if a heat pump system has already been installed. But you can do some quick research to see if there any major complaints and issues with a particular brand or model. SEER/EER Ratings: When it comes to an AC heat pump the two things you must be aware of are their SEER and EER ratings. Seasonal Energy Efficiency Ratio (SEER) is used to measure the efficiency or effectiveness of an AC unit. The higher the SEER rating on a heat pump the less energy it should use over the entire summer. On the other hand the Energy Efficiency Ratio (EER) measures how a heat pump air conditioner would handle a set testing level (95oF) or its efficiency during peak times. Like the SEER, the higher the EER the better. Service Records: Another thing you should look for is the maintenance or HVAC repair records for the heat pump. While there is little most homeowners can do to maintain an air conditioning heat pump on their own, you should still ask the current homeowner or real estate agent about any troubles or problems the system has had in the past. Age of Unit: You should also ask how old the system is since most of the one installing the middle of the last century are due for a replacement. Now that you know a bit more about how a heat pump air conditioner works versus an old fashioned dual system, you can continue your home search. 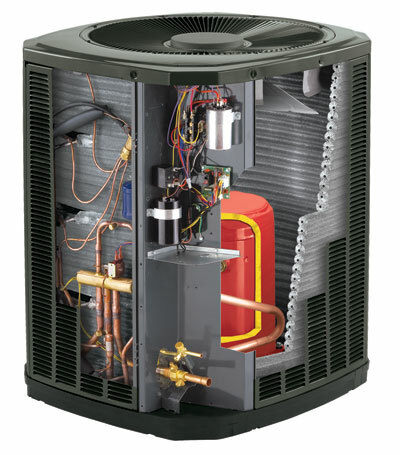 Heat pump air cooling and air conditioning have similarities in how their systems work. 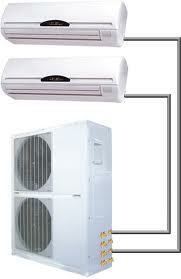 Both heat pump air conditioning and ordinary air conditioners rely on the principle of heat transference. Basically they work by pulling heat from the surrounding air and then moving or transferring that heat into another location. It’s this ability to absorb the heat from the very air inside a room or house in warm weather and transport it to the outside that makes indoor air cooling possible. But while heat transference is a common element between these 2 devices they still have some major differences. First of all, standard air conditioners use what is called a “vapor compression cycle”. Vapor compression is where a heat sensitive refrigerant is pressurized and then pumped through a series of coils where the pressure is released in a flash evaporation process, which allows the refrigerant to absorb the maximum heat in the surrounding air. An air handler or blower motor then circulates the cooled air into the house. Heat pump air conditioning on the other hand relies on a process that is called the “reverse refrigeration cycle”. In this process the cooling system has entire system has an added expansion or reversing value which allows the heat pump to change from cold weather heating to warm weather cooling. 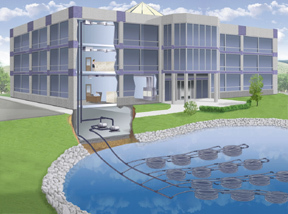 Using two units: one outside and one inside, air conditioning heat pumps use a completely reversible system. The outside unit or evaporator uses an electrical motor to move a special heat absorbing refrigerant (usually R-22 which is being gradually phased out for environmental reasons) through coils set inside the unit. Even at 32 F or 0 C, outside air still has enough heat in it to warm an average home comfortably. Once the refrigerant picks up the heat, it is compressed and sent through pipelines to the inside unit. The inside unit or condenser then transfers or exchanges the heat into an air handler or blower unit which then circulates the warmed air though out the inside of the home. In summer, air conditioning heat pumps work in the direct opposite way. The inside unit now acts as the evaporator and pulls hot air from inside the home across the heat absorbing refrigerant coils set within the unit. The air handler then circulates the cooled down air. As the refrigerant absorbs the heat, it is compressed and sent through the lines to the outside unit which has become the condenser. The condenser releases the heat into air away from the home. The cycle is complete, but in reverse of the winter cycle. Now that you understand how using heat pump air conditioning allows you to have the benefits of central air conditioning with the added value of a comfortable home heating system in the colder months. 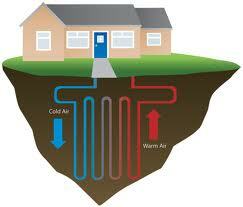 Previous Article What Exactly Are Ground Source Heat Pumps?